It has been a busy past few days, I think as soon as December hits it gets crazy for most people. On top of the holidays, we have two birthdays, my sister flying in and a trip planned. Ahh! The neat freak, organized part of me is starting to panic, but I know that will not do any good, so I will just take one day at a time. Deep breaths Rita, deep breaths. Since we keep the shabbat, it means I prep, bake and clean the house every Friday/Thursday. It is a lot of work but something I am used to. Both my husband and I have kept the shabbat, out parents, grandparents and so on. Anyways, I have been on a kick of trying out new cake recipes. Before this, I was never a fan of baking cakes. Not because I don't like cakes, oh I love cakes! Mostly because they are too time consuming and usually ended up being a flop. However, 10 years down the road I learned a few things here and there. This cake is surprisingly easy to make and tastes amazing. Basically like licking some condensed milk. mmmm..... The Russian part of me can not live without condensed milk. A holy grail product in my pantry. Set up 3 mixing bowls: 1 medium and 2 large bowls. In the medium bowl, whisk together 1 cup flour, 1½ tsp baking powder and ¼ tsp salt. Set aside. Separate eggs into the other two large bowls. Egg yolks into one and egg whites into the other. Beat egg yolks with ¾ cup sugar on high speed until yolks are pale yellow (approx 2 min). Stir in ⅓ cup milk and 1 tsp vanilla extract. Pour flour mixture over your egg yolk mixture and beat on low speed with the mixer until just combined. With a clean, beat egg whites on high speed until soft peaks form (1 minute). With the mixer on, pour in remaining ¼ cup sugar and beat on high speed until egg whites are stiff but not dry (1 minute). Gently fold egg whites into the yolk/flour mixture until just combined. Divide evenly between two cake pans and bake at 350˚F for 30 minutes or until a toothpick comes out clean. Turn cake onto a wire rack and allow to cool to room temp. In a large measuring cup with a pouring lip, stir together ⅔ of the evaporated milk, ⅔ of the sweetened condensed milk and ¼ cup heavy whipping cream. Place one of the layers, flat side down, on a cake platter. Using a fork, poke the top all around, going all the way to the edges and poke through the depth of the cake. Use a spoon to pour on half of the 3-milk syrup. Let cake stand and absorb the syrup while you beat the frosting (see instructions below). Generously frost the top of your first layer, then arrange sliced strawberries over the top of your frosting. 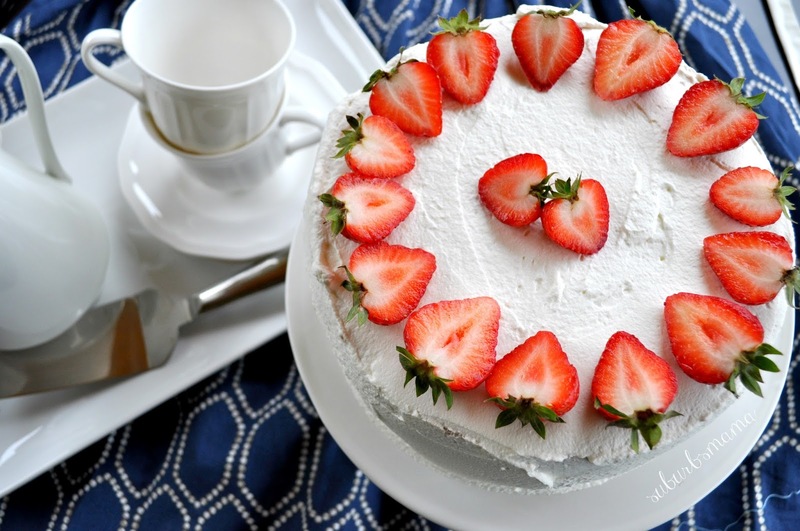 Your next cake layer will be placed with the flat side up; so before putting it over the strawberries, use a fork to poke the flat surface all around, going to the edges. Now place your poked cake top over the strawberries. Spoon the remaining half of the 3-milk syrup evenly over your top layer. Let cake stand 10-15 minutes for the syrup to soak in for easier frosting. Frost the top and sides of the cake and smooth out frosting with a cake spatula. I decorated the top with halved strawberries, placed at an angle around the top border of the cake. It was simple and just perfect. Beat 2½ cups heavy whipping cream and 2½ Tbsp sugar on high speed until thick and spreadable (about 1½ to 2 minutes). Don't overbeat or it will turn buttery. Refrigerate until ready to use. Again, thank you Natasha for another amazing recipe!